Entertaining at home can be challenging in a small space, but that shouldn’t stop you from hosting a cozy get-together with friends. These five DIY home bars can help. Each solution carves out a spot for mixing drinks and storing spirits. When the party is over, each of these ideas can be used for something else like an entertainment center or even a desk. The problem: Affordable furniture designed for small spaces can be tough to find. The solution: Old cabinets built for small midcentury homes are usually cheap and plentiful. Nicole Phillips, the expert DIYer behind Visual Heart transformed an ugly vintage cabinet with good bones into a swoon-worthy bar. What to do after the party? This neat idea can double as a retro-fantastic entertainment center. The problem: New bar carts are pricey. Even "inexpensive" options sold at Target or World Market fetch more than $125. The solution: Andrew Snavely who pens Primer Magazine turned a $40 tool cart from Harbor Freight Tools into a swanky cocktail station. What to do after the party? This idea can double as a landing strip for a tiny foyer. The bottom shelf is the perfect height for storing wellies or winter boots. The problem: You need an elegant solution that won't cramp your small living room. The solution: Erica from Honestly Yum, whipped up a chic, butler's bar tray and stand. Not only is this idea dazzling to look at, but it also provides just enough room for making the perfect Martini. The problem: You want something big enough to hold a large beverage dispenser and a cooler filled with beer. 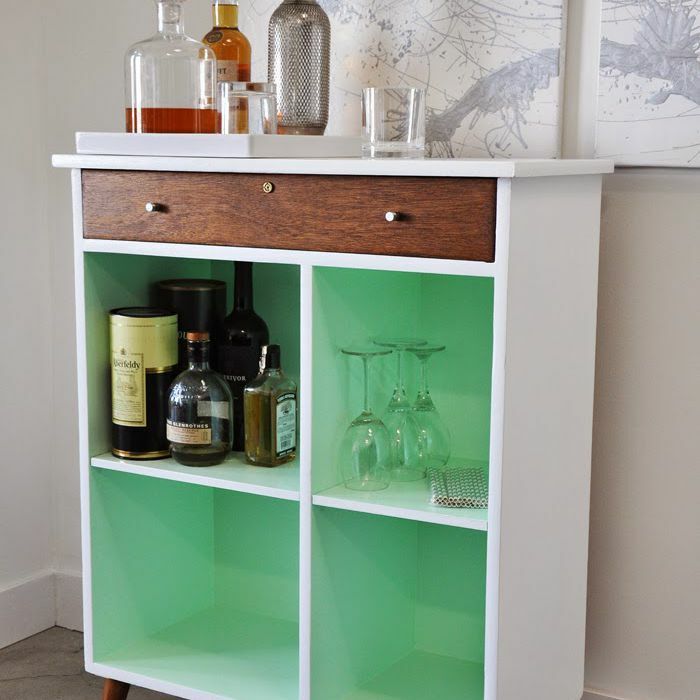 The solution: Jen at Rustic Glam transformed an old TV cart into a compact yet roomy bar cart. What to do after the party? This idea can double as a mini-kitchen island or bookshelf. The problem: You want a cheap and cheerful solution that you don't have to DIY. The solution: Mandy the blogger behind The Haps, bought a functional kitchen cart at IKEA called the RÅSKOG. Thinking out of the box cost her less than $50. What to do after the party? There are seriously gazillions of ways you can use this practical cart in any room that needs extra storage. Take a peek at the RÅSKOG. The problem: You barely have room for your desk, not to mention a home bar. The solution: A desk that transforms into a bar means you can have a place to work and party. What to do after the party? This unique piece of double duty furniture has enough room to store secretly up to 20+ bottles of booze. You'll find the DIY instructions here.